William L'E. Wertheimer - Dughi, Hewit & Domalewski, P.C. William L’E. Wertheimer came to Dughi, Hewit & Domalewski in February 2012 after serving into his 28th year as a Superior Court Judge and reaching mandatory retirement. At the time of his retirement Judge Wertheimer was the senior judge in Union County and the third most senior judge in the State. 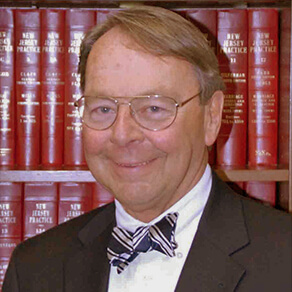 During his tenure on the Superior Court, he served as the Presiding Judge of both the Civil and Criminal Divisions and on the Appellate Division. He gained a reputation for his ability and keen insight in management of complex matters and for his realistic resolutions of same. As a judge, and before that as a trial attorney, he demonstrated proficiency in professional negligence, products liability, construction, insurance coverage, toxic tort, and severe and serious personal injury matters. Bill was commissioned in the United States Army (Infantry) in 1964 and upon graduation from law school served on active duty from 1967 to 1969. After initial assignment overseas as a mechanized Infantry company commander, he was detailed as Chief Trial Counsel, Courts and Boards, Fort Dix, where he tried over 1,000 cases. Upon discharge, Bill joined, and eventually became a partner in, one of New Jersey’s prestigious law firms as a trial lawyer and tried cases throughout the state. He has taught courses for new judges and continuing legal education courses for judges and lawyers and is author of many reported decisions. Bill has been named to Who’s Who in American Law, Third Edition, is a Fellow of the International Society of Barristers, a Life Fellow of the American Bar Foundation, a sustaining member of the Union County Bar Association, a member of the American Arbitration Association, and was a Charter Member and Master of the Richard J. Hughes American Inn of Court. He has also been active with the National Association of Railroad Trial Counsel, the Essex, New Jersey and American Bar Associations. He has been admitted to the practice of law in New Jersey and New York, as well as the United States District Court and the Third Circuit Court of Appeals. Judge Wertheimer heads the firm’s Alternative Dispute Resolution/Mediation Department. Since joining the firm Bill has served as a Mediator in Class Action, patent,insurance coverage, legal and medical malpractice, contract, personal injury and employment related matters. He has also been appointed as a Special Master, Monitor and a Special Fiscal Agent as well as an Arbitrator in a variety of other disputes. He has taught, and will continue to teach, trial techniques, tactics and skills in CLE-related courses. Press Release: Judge Wertheimer Joins Dughi, Hewit & Domalewski, P.C.